It’s a dog-eat-dog world when it comes to producing and selling tires and wheels for any platform these days. Getting tires produced is somewhat easy for companies to do, especially with the rise in rubber manufacturing in China, but the hard part is to build them to last and perform. For a new company, this would be a daunting task to try to get it up off the ground and market their products correctly to the UTV and ATV world. Some might say it’s too tough, but companies who already have products and want to add a second line of tires and wheels, that might be easier for them. That was the case for Tire Mart, Inc. Tire Mart manufactures the popular Pit Bull tires right here in the good ol’ USA. They wanted to expand their product line by adding a great tire and wheel designed in the U.S. but have them manufactured in China. This is where they forged a new wheel and tire company aptly named Braven Off-Road! Braven’s mission was to design and produce a tire that can withstand any type of battle that may ensue out on the trail. The $160.01 Ironside tire is designed with strength in mind with eight-ply radial construction. 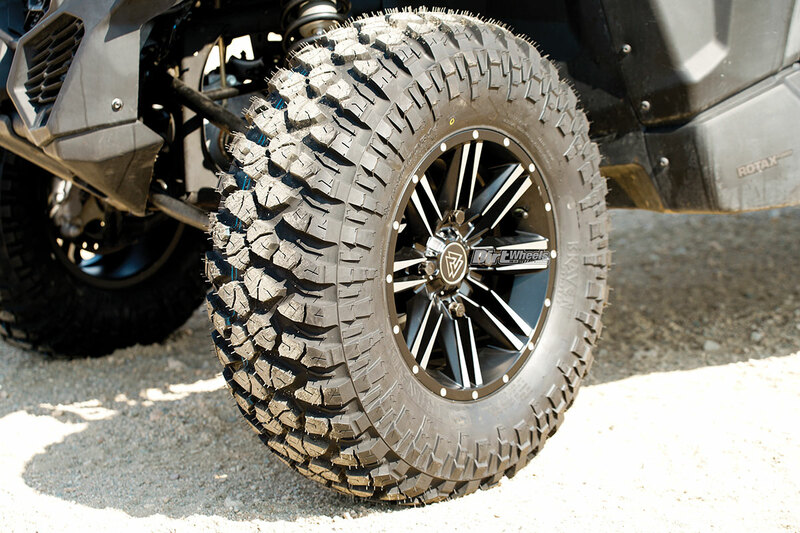 The staggered tread-lug and staggered shoulder-lug designs create optimum traction for desert or hard-pack terrain. However, if you do find yourself in a sticky situation, the mud clean-outs are large enough to help with the muck. 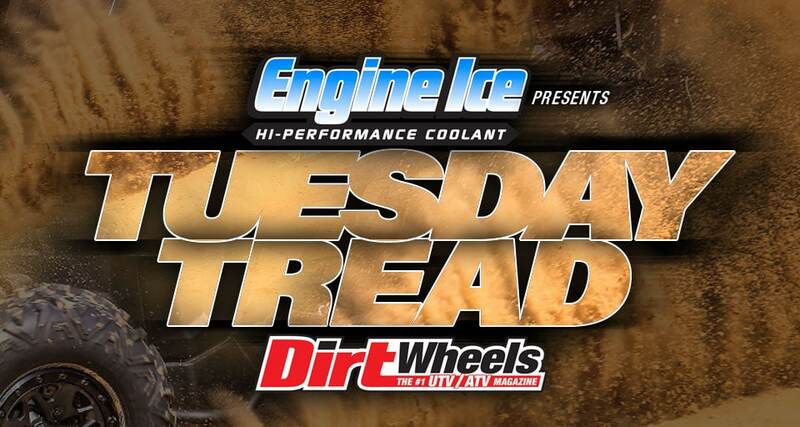 The Ironside also features tread siping that creates better traction in all conditions. The tires also come designed with stone kicker bars that help wiggle out any foreign-matter buildup. Other sizes include 27-inch to 32-inch tires. Prices start out at $140.91 for the 27s and go up from there. Building off the Ironside name, $114.83 Ironside ATV/UTV wheels are a great match to its rubber counterpart. The 14-inch Ironside wheels are made from aluminum, which makes them lightweight and strong. They’re a non-beadlock design and are offered in black and machined black. Braven’s Ironside wheel is offered in popular bolt patterns such as 4×110, 4×137 and 4×156. Also, 5×2 and 4×3 offsets are available to choose from. 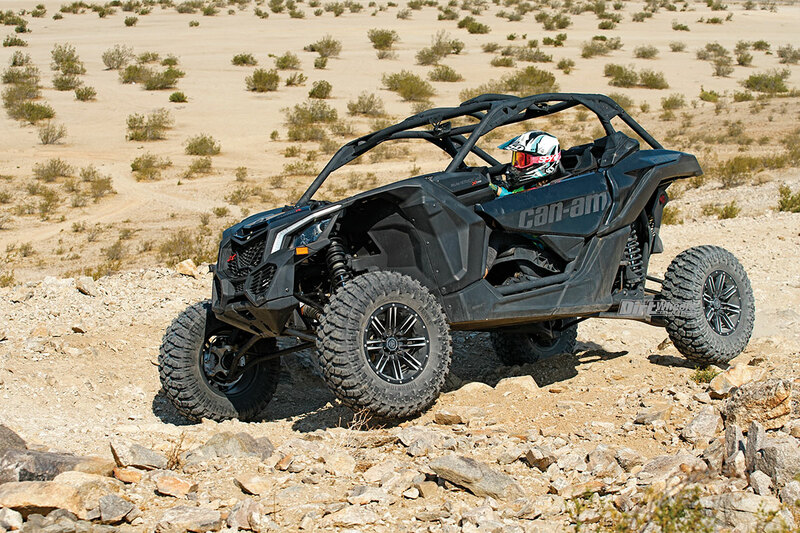 When we ordered a set of the Braven Ironside wheels and tires, we decided to try them out on our 2017 Can-Am X3 X ds model. But instead of going with larger sizing, we wanted to try out a set of 28-inch tires, just like what comes on the base-model Can-Am X3. The lower 28-inch tires gave us an even lower center of gravity in the X3 compared to the 29-inch Maxxis Bighorns that come stock. It also helped the X3 accelerate quicker, but it did lose out a bit on top speed. We didn’t have any issues clearing rock sections with the suspension or frame. The Ironside performed very well for us in the SoCal desert. Its large contact patch increased the X3’s traction in rocky areas and in the harsh, whooped-out corners. Forward traction in the soft, sandy sections was also increased. Another plus is that the Ironside tire and wheel combo weighs around the same as the stock Can-Am beadlock wheels and Bighorn 2.0 tires, which means more horsepower with the X3 and more protection with the eight-ply tire. We did miss the security of having a beadlock wheel, but we had zero flats. After pounding the harsh grounds of Barstow, California, we concluded that these tires can run with the best and, most of time, at a lower price. For more information on Braven’s products, visit www.bravenoffroad.com.